This article expresses the current view of the European Society of Gastrointestinal Endoscopy (ESGE) about radiation protection for endoscopic procedures, in particular endoscopic retrograde cholangiopancreatography (ERCP). Particular cases, including pregnant women and pediatric patients, are also discussed. 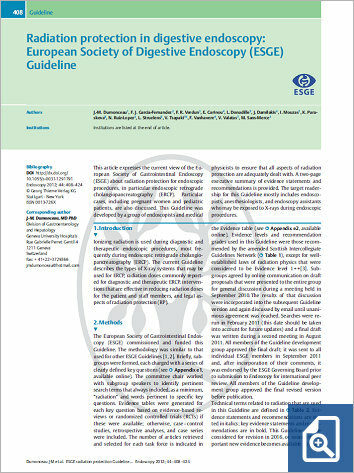 This Guideline was developed by a group of endoscopists and medical physicists to ensure that all aspects of radiation protection are adequately dealt with. A two-page executive summary of evidence statements and recommendations is provided. The target readership for this Guideline mostly includes endoscopists, anesthesiologists, and endoscopy assistants who may be exposed to X-rays during endoscopic procedures.